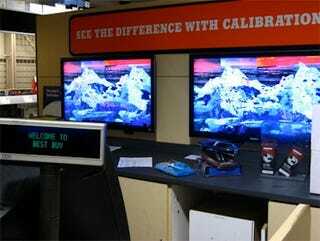 Generally, a Best Buy's monstrous collection of HDTVs display repetitive, lame video clips and advertisements. But on artist convinced a Manhattan Best Buy to hand over all of their HDTVs for a digital gallery. This abstract collection of video paintings by Borna Sammak was created through the heavy post-processing/layering of found footage from sources like Planet Earth. But how did Sammak secure the Best Buy gallery, especially during regular business hours? He simply asked the manager while hinting at increased foot traffic. Needless to say, Best Buy could transition itself from faceless retailer to hip uncle status if more locations supported local and experimental film like this through digital community outreach programs. Let's make this happen, BB!